When it comes to deserts, I've never really been an ice cream fan, but give me some yoghurt....... mmmh, i will be happy. 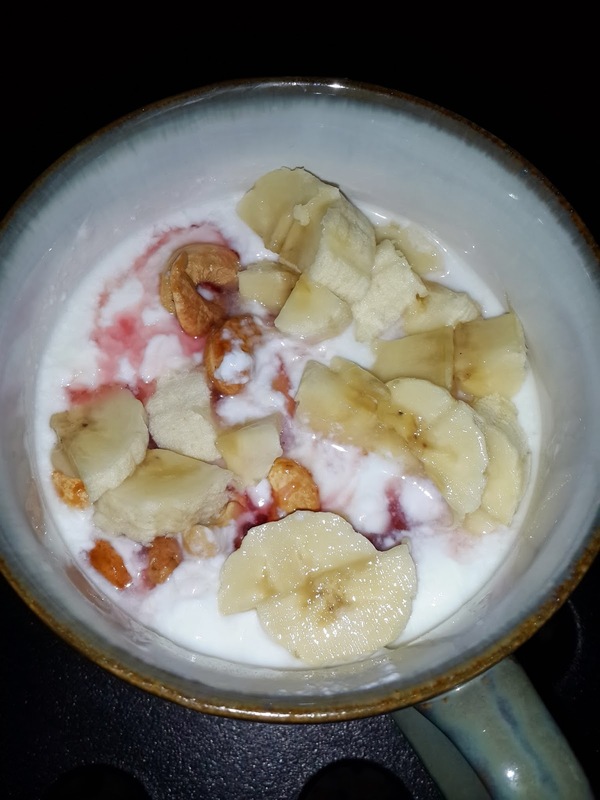 I have always loved yoghurt, when i was pregnant with my second baby i had so much of it that i lost count. The only thing that has changed since I've been on a weight loss journey is that i don't eat the sweetened kind, i only do plain unsweetened yoghurt. I have developed a taste for it. I buy mine from a Lebanese store close to me, its really sour, creamy, loaded with lots of nutrients and very affordable. Its plainness makes it easy for me to work with. Its fat free also. I had a heavy breakfast today so at lunch time, i didn't feel like eating any heavy meal so i made me a cup of yoghurt delight instead. Its very easy. I didn't mix them all up because, i like to taste every item in every scoop. Lol. Its really yummy, you need to try this and its very filling too. I don't think i will eat any other thing till 7 or 8pm. Have a blessed weekend sweets. God bless.